Carlson & Turner Books has more than 40,000 volumes neatly filed on its shelves. Capron’s Katie Made Bakery may be one reason that folks are discovering this corner of Portland where Munjoy Hill overlooks the Old Port and Downtown. They can start the day with a lemon ginger scone, a slice of blueberry coffee cake, or one of the popular breakfast sandwiches her sister Jennifer Capron makes in the savory kitchen. Robert and Jeanne Bull had stopped in for a couple of the egg sandwiches and they agreed that the East End’s star is rising. “We’ve been here on Munjoy Hill for 35 years,” Robert said. “It used to be pretty rough. Our friends thought we were crazy to buy here.” Now those same friends might be a tad envious of the East End’s emerging identity as one of Portland’s coolest spots. “One of the thrills of this neighborhood is that you can just walk around to so many shops and restaurants,” Jeanne told us. A good place to start a tour of the East End is on Munjoy Hill near the Portland Observatory. The red-shingled landmark (closed for the winter) was built to watch for merchant ships approaching the harbor and underscores the neighborhood’s proximity to the ocean. French-born baker Chris Deutsch picked this catbird seat to open Belleville across the street about a year ago. Although he calls himself largely self-taught, his croissants and pain au chocolat would not be out of place in the upper Marais. Deutsch channels Italy at lunch time and some evenings with Roman-style pan pizza with toppings such as fig-rosemary and spinach-artichoke. When we stopped for a flaky Brittany butter pastry, locals were streaming in and out. “It’s a fantastic neighborhood with a village feel,” Deutsch said. Katie Capron of Katie Made Bakery has been satisfying the sweet tooth of Portland's East Enders for years. Hours may be flexible on slow winter days. From the peak of Munjoy Hill, it’s a straight downhill stroll along Congress Street, the neighborhood’s vertical main drag. Once you cross Washington Avenue, the other principal commercial thoroughfare, idiosyncratic little shops and eateries sit cheek by jowl. The Snug (which advertises an “insane happy hour”) nestles up to Otto Pizza, which is flanked in turn by a coffee shop and crêpe joint, Sip of Europe. Carlson & Turner Books, a pre-renaissance anchor of Munjoy Hill, is perhaps the most erudite shop on the street. More than 40,000 antiquarian and used books fill its labyrinth of bookcases. Scattered about are such oddities as a platen printing press, a wax cylinder dictaphone, and some manual typewriters. The proprietors also have a sense of humor. Don’t miss the collection of “Tackiest Postcards” on the counter. The Portland Observatory crowns Munjoy Hill, the peak of the East End. Maine Craft Distilling makes a range of potables and serves them straight or in cocktails. The tasting room also offers a nice selection of food. It always bodes well for a neighborhood’s karmic health when an independent bookstore moves in. Print: A Bookstore brought a positive jolt of energy when it opened at the end of 2016 in a bright space with big windows facing the street. Children’s reading hours bubble with enthusiasm from the young families now populating Munjoy Hill. The shop’s wide selection of books by Maine authors and lots of general fiction and nonfiction is augmented by cards for all occasions, including for friends celebrating a gender change. Otherwise, head to Washington Avenue, where the East End assumes a more multicultural vibe. Last year, Kittery stalwart Bob’s Clam Hut opened an outpost at the corner of Cumberland and Washington avenues. If you’re not in the mood for fried clams, Washington Avenue boasts an Ethiopian restaurant, an African market, a boutique Texas barbecue place, a vegan cafe and marketplace, a pho joint, and a Salvadoran restaurant. Drifters Wife, a chef-driven locavore restaurant with its own wine shop (Maine & Loire) in back, is a national critical darling. Aficionados of the Duckfat restaurant's famous fries can get them at Duckfat Friteshack without waiting in line at the restaurant. You’ll have to follow a short pathway from the sidewalk to reach Dr. Dandelion, the tiny shop where Deb Robbins packages and sells her handmade olive oil soaps and body products. On the opposite side of Washington Avenue, VENN + MAKER stocks only goods made in Maine — from textiles and ceramics to jewelry and small pieces of furniture. The practical but elegant leather and canvas purses, backpacks, and totes are made on the premises. Craft alcohol has also put a stamp on Washington Avenue. Oxbow Blending & Bottling is the urban component of Newcastle’s Oxbow Brewing Company, producer of farmhouse ales. The Portland barrel-aging and bottling facility has a cavernous tasting room. It serves about a dozen current drafts and more than two dozen bottled beers from Oxbow and other local brewers. Cult favorite restaurant Duckfat has established a walk-up Friteshack in the alley “beer garden.” You can pick up poutine and Belgian-style frites to enjoy with your beer in the tasting room. Jeweler Jen Burrall also sells artfully curated used clothing and accessories. Hardshore Distilling Company released its craft gin in 2016 and has other products in the works. It offers free tastings along with a menu of gin-based cocktails. 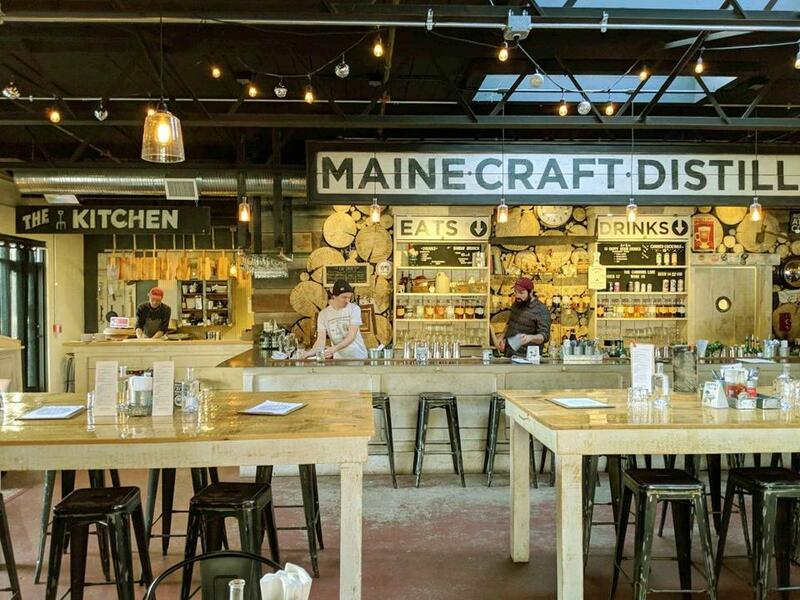 Maine Craft Distilling, on the other hand, creates a number of spirits, including rum, whiskey, blueberry moonshine, gin, and a botanical spirit made with carrots. Its tasting room is a real destination, with cheese and charcuterie plates, sandwiches and bar bites, and a seasonal cocktail menu. There’s live music Thursday through Saturday nights, a Sunday jazz brunch, and distillery tours on Saturday and Sunday. Washington Avenue pioneer Maine Mead Works fits right into this unconventional neighborhood. “It is unique to find a place with a sole focus on mead in a beer town,” acknowledged tasting room manager Tom Preti. A font of knowledge about mead, he guides visitors through a tasting that might include dry, blueberry, lavender, and chai meads. Preti also lives in the East End and is full of tips and stories about the neighborhood. Contact Patricia Harris and David Lyon at harrislyon@gmail.com.